For the most part, Summer Games II was even more successful than its predecessor, and its current status still holds true to its legacy. At Lemon64, the game has a score of 8.6 from 210 votes, which is 0.1 more from a dozen more votes, and it is ranked at #27 in the Top 100 voters' list with at least 100 votes. At LemonAmiga, the score is a bit less dramatic 7.67 from a total of only 15 votes. 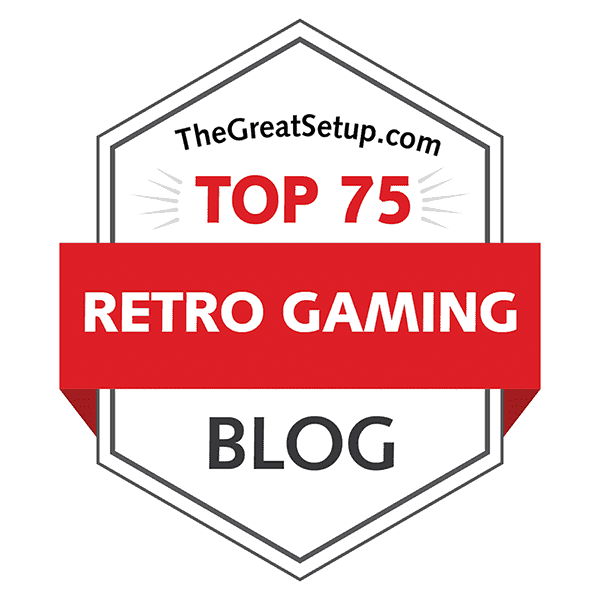 The score at World of Spectrum is currently 6.59 from 17 votes, and while CPC-Softs has no rating at all, the one review at CPC Game Reviews has given it a measly 3 out of 10. At Abandonia, both the editor and 5 people have rated the DOS-booter version a nice, round 4.0, but there are 6 more votes for it at MobyGames, with a score of 3.7. For the Apple ][ version, I haven't come across any scores, and even more strangely, I haven't managed to find the Atari ST/STe version at all - Atarimania hasn't even got the game documented, and while Atari Legend does, the game doesn't appear to want to be found from anywhere. But if you manage to find a two-disk version of the first Summer Games for ST, why not boot the ST with the second disk, and see what happens... Now, let's get on with the last comparison of this season. 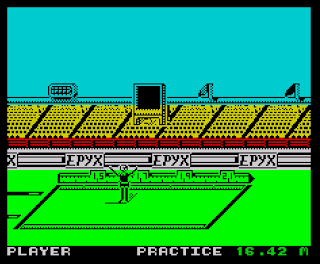 For those of you well acquainted with Epyx's sports series, Summer Games II needs no introduction, and those of you, who do need one, you might as well read the description in my comparison of the first Summer Games. 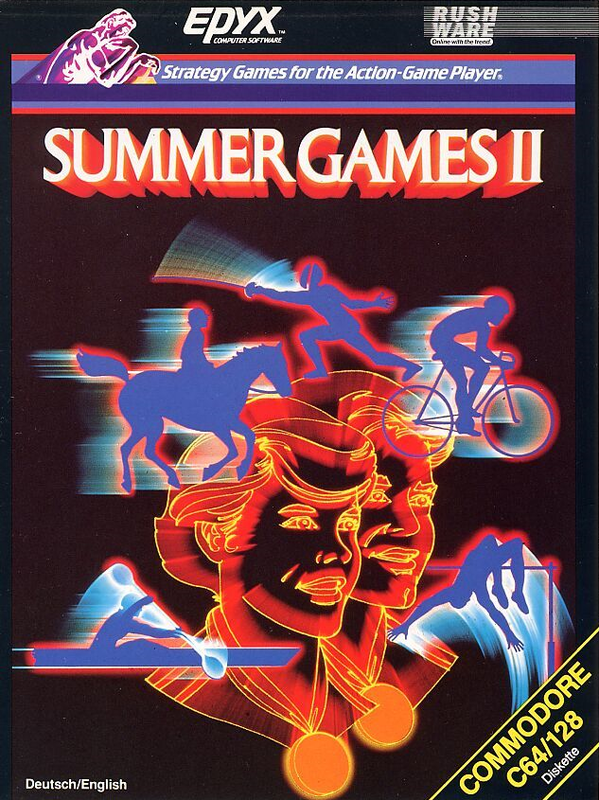 Still, in short, Summer Games II is one of the most high-profile multi-event sports games ever created for any 8-bit computer, despite having no official IOC licensing, and is the second entry in the Games series. Like its predecessor, SG2 features eight events, and the game can be played by up to eight players. Back in the day, the most remarkable thing about SG2 must have been its ability to incorporate the events from the original Summer Games, although you needed to have the original SG1 diskette to be able to do so. Still, the events are interesting enough by themselves. As I've mentioned already, Summer Games II is my favourite of the two Summer Games games, so I might not be the most unbiased person to review it. But I will say this: it's not everybody's cup of tea. The events can be considered somewhat off the wall and not necessarily all that topical, and some of the events can be dreadfully difficult to learn to master. Still, if nothing else, it will nicely fill the gap left by the original Summer Games with some more of our favourite athletic events. For any fan of athletic sports games, I can only recommend it highly, but it does take time to get used to. Now, before I start dealing with anything else, a quick word of advice might be in order: Summer Games II should only be played with a joystick. It is possible to play some versions on keyboard, but certain events require you to do things your hands will likely never be able to handle in the required manner by using cursor keys. Only the DOS version is slightly less painful to play on keyboard, but a joystick is still recommended, as long as it's not analog. Speaking of the DOS version, I'm quite sure there are only a handful of retrogamers out there, who actually have a working PC with a 286MHz processor or older, so most of you will be likely using DOSbox in order to attempt playing Summer Games II on DOS. Well, if it helps, I needed to slow DOSbox down to around 400-500 cycles for it to be playable. Since there are no Atari 2600 or NES versions around this time, you would expect all the conversions to be boringly similar to the original, and feature all the events in correct order. For the most part, this is woefully true. The events are, in their correct order: Triple Jump, Rowing, Javelin, Equestrian, High Jump, Fencing, Cycling and Kayaking. And therein lies the reason for this being my favourite of the two Summer Gameses - this one has more unexpected events, and there are no cheap filler events like in the previous two games in the series. 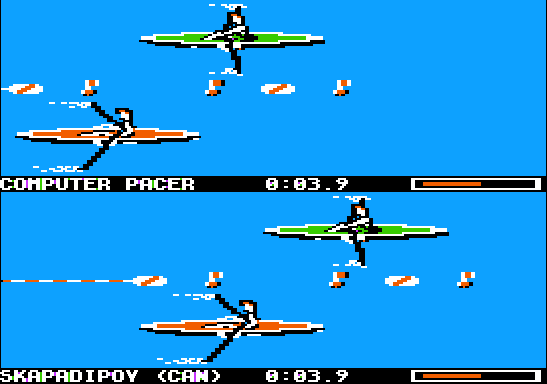 Anyway, the DOS version is the only one to feature some variety in the order: High Jump comes before Javelin. Of course, like most other titles in the series, Summer Games II starts off with the opening ceremony. At least, most versions do. After that, you are taken to the main menu, where you can choose to practice one of the events, or compete in one or more events, or go through the whole thing. Additionally, you can choose to view both ceremonies separate from the competition mode, but all the other options depend on which version you're playing. 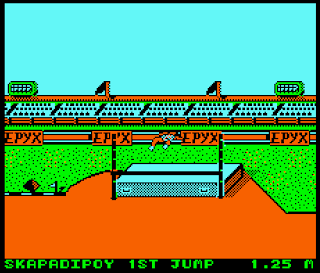 The C64, APPLE, AMIGA and ST versions allow you to play the events from the first Summer Games; the DOS and APPLE versions have sound options; apart from the AMIGA and ST versions, every version allows you to see the world records; and finally, the C64, AMIGA, ST and SPECTRUM versions have some control options. For some reason, the AMSTRAD version has a Quit item on the menu, which is strange, because it's easier to turn the power switch from your computer. For DOS users, it will be useful to know, that you can quit the game by pressing CTRL+X at any time. If you have played any of the games from Epyx's sports series, or read my earlier comparisons of Winter Games and Summer Games, you know how the signing in process goes. If not, you might want to remind yourself by playing any of the games, or watching a video on YouTube, or take a look at either of my earlier Epyx sports game comparisons - I'm too lazy and/or busy to bother dealing with that thing again, because there's nothing new really worth mentioning yet. But, once you have completed the signing in process, you have a bunch of events to load and play. One more quick note before we head off to the events: as a rule, the ATARI ST version plays slower (and has a lower framerate) than the AMIGA version (the Fencing event being the only exception), but otherwise there are no notable differences between the two. 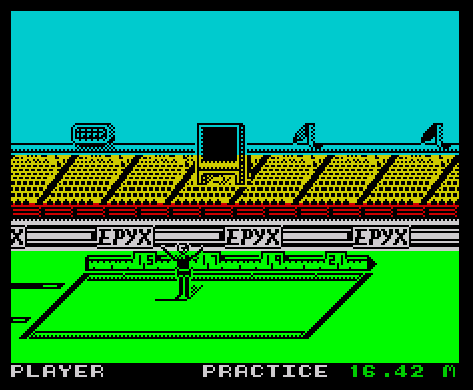 Similarly to my previous two Epyx sports game comparisons, I shall begin by briefly describing the events, in case one of you has managed to sleep during the exercise classes. For starters, Triple Jump is similar enough to Long Jump - you gather up speed on a runway to jump as far away from the jumping line (or plank) as you possibly can, only in Triple Jump, you take two long leaps before the final push onto the sandpit. This is, in essence, a timing game. You don't have to waggle your joystick in this event, you just push the fire button to make your athlete run. Once he reaches the takeoff line, move the joystick RIGHT to start jumping; on the next step, push right again; and on the third step, you need to jump, so push the joystick LEFT instead. While you are flying, you have to push the joystick FORWARDS (a.k.a. UP) to boost your flight. For some reason, though, I think pulling the joystick DOWN is sometimes more effective, at least in some versions, but really, the main focus is to keep your timing tight as Buddy Rich, no matter which version you're playing. I cannot say, whether the event works as well as it should in the APPLE version, because the version I found from the internet didn't manage to load this particular event completely. But all the others I got to play, and make notes of differences. 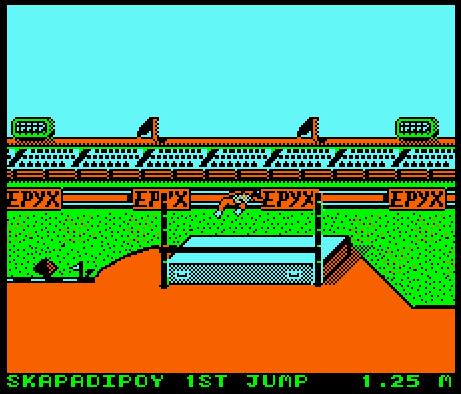 The AMIGA and ATARI ST versions make you anticipate the triple-jumper's hops and steps and whatnot - this makes jumping with precision practically impossible. The DOS version, at least, works as perfectly as the original. 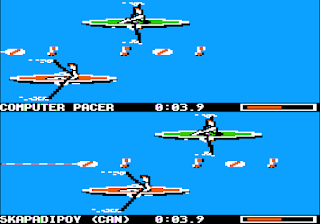 In the Rowing event, you race in your canoe head-to-head against either a computer opponent or a human opponent for 250m. For this event, you need to start waggling, but instead of frantic seizure-like action, you need to pull the joystick left and right in a steady rhythm to get the maximum power from bending the oars. Of course, these games shouldn't be played alone, but in case you are, the computer opponent is completely useless in the SPECTRUM and AMSTRAD versions. If you have a good run, the computer opponent should be just about halfway through the course when you've crossed the finish line. The other versions only differ from the original by playing speed. 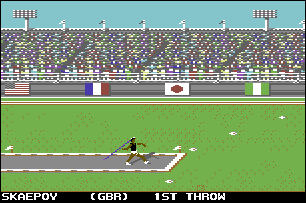 Javelin is usually my favourite event in most Decathlon-like multi-event sports games. Your job is to gather up speed while carrying a javelin for a short distance of a runway, and then throw is as far as possible. Couldn't be simpler. Well, it could, but you'd have to play a different game then. This event requires some properly physical action, as well as some precise timing. Instead of waggling the joystick, you need to tap the fire button as many times as you can within the allotted space, in order to build up speed. To throw the javelin, move the joystick LEFT a step or two before the plank, and HOLD the joystick left to raise your throwing angle. Release the joystick to lock the angle and throw. A good throw should land the javelin somewhere after the 80 meters mark, but getting it past 95 is difficult. The APPLE version suffers from a bad framerate, so it's difficult to get your athlete up to speed, as the controls only work so well as the game has the energy to respond to them. While the ST version suffers from a similar lack of speed, at least it responds to your commands as it should. In the SPECTRUM and AMSTRAD versions, the javelin has to be thrown in a slightly different manner. Releasing the joystick or left key at your chosen time will only make the javelin go down the same way it came up, and most likely, your athlete will eventually throw it in a straight line. You need to push the joystick right to throw the javelin after you have decided upon its throwing angle - however, this doesn't quite work properly every time. Equestrian is a strange word for people not natively English- or Latin-speaking, and even there, I imagine the word's origins might not particularly well known. Of course, it basically means horseback riding, and it's derived from the Latin words "equus" (horse) and "equester" (horseman/rider). Apart from riding on horseback, your job is to jump over a number of obstacles (barristers), keep the horse in control and bring yourself safely over the finish line, hopefully in a good time. This event is probably the most irritating, unforgiving and frustrating one in Summer Games II, and I happen to be strangely addicted to it. The problem is not controls - they couldn't be much easier, although perhaps they could be more logical. Your thoroughbred starts moving forward by pushing the joystick UP. The horse's speed will increase each time you push the joystick up, and decrease by pulling down. You can also turn and walk backwards, if the situation requires it of you. Jumping over barristers should happen by pushing the joystick RIGHT, but the timing is critical - the horse might refuse to jump if you move the joystick right too early or too late. Once you have successfully initiated the jump, you need to land the jump by pulling the joystick LEFT. If the landing fails, the horse will fall, and you will get a penalty. 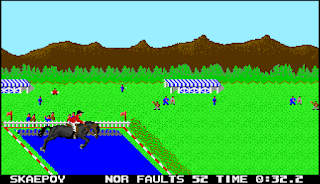 Penalties are also given for not making the horse jump, and exceeding the time limit. Anyway, if (and when) you do fall, press the fire button to get back in the saddle. The event will end only when you cross the finish line. The way the SPECTRUM and AMSTRAD versions differ from the norm this time, is the amount of penalty points allowed before you are disqualified. You are automatically disqualified from crossing the 100 seconds time limit, but you also have a doubled amount of allowed penalty: 200 over the normal 100, but the disqualification doesn't come until the end, or before the timer reaches 100. This would come in handy, if the event was as playable as the other versions are, but the timing for the jumps are made slightly off, so it's more bothersome to get through the course. 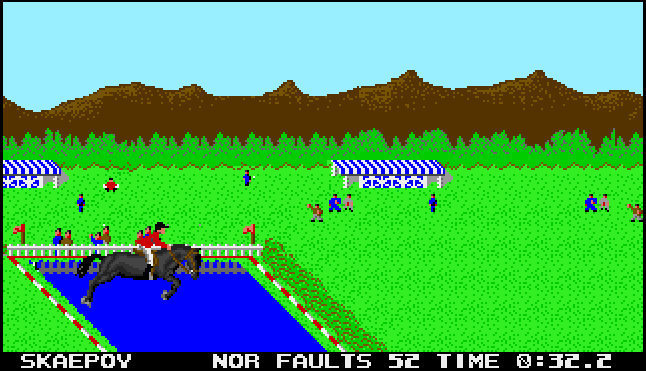 In the AMIGA and ATARI ST versions, it seems like your horse has a tendency to anticipate your moves. A good time to jump is normally when the horse's head has passed the flag behind it, but sometimes, the horse might jump automatically if you let it go that far. It doesn't work all times, though. Otherwise, both versions work as fine as you could ever expect. Again, the APPLE version is slightly slower than the others, but not as bad as usual. In fact, the speed is very similar to the ATARI ST version, if you can count that as a positive thing. There is, however, something quite unusual about it: if you need to back up after a fault, the horse will turn back after a few steps - you have no control over the amount of distance you can take to prepare for another attempt at jumping over a barrister. The third, and the last of the more traditional athletic events in the game, is where you need to - once again - gather up some speed on a runway, just to get enough momentum to force yourself over a vertical bar between two poles on a certain height. Thus, High Jump. It starts off with the game giving you the chance to set the bar height. The minimum height is 1m 50cm for competition, and 1m 20cm for practice, and the bar height can be moved 5cm at a time. The SPECTRUM and AMSTRAD versions differ in that they allow you to change the height back down in the beginning, if you're not sure about going too high with it - the other versions only go up. After you have chosen the bar height, you will be sent some distance away to start your run from. As you make your approach, tap the joystick right in the rhythm of your athlete's feet to run faster, push up to approach closer to the bar, and down to widen the angle of your approach. Press fire to jump, and while in the air, push up to flip up and over the bar. As usual, you get three attempts to make a successful jump, and the event will only be over once this unwanted event takes place. This is my least favourite event in the entire game, for two reasons: it's never been a favourite of mine in the first place, even in Decathlon or other similar games which have included this event, where it's much simpler. The other reason is exactly that: it's arguably too difficult for what it is. The controls can be handled easily enough, but the timing is impossibly exact in this event, and in my 30 years of playing this game, 17th of June, 2016, 3:08 AM marks the first time I was ever able to get over the bar at the minimum competition height. Since then, I have only managed to get over the bar once in the original. Once again, the APPLE version plays a bit slower than the others, but more than that: the timing for nudging yourself over the bar is not nearly as strict as in the other versions. Even still, I have only managed to get over 1.75m. As you will have come to expect at this point, the SPECTRUM and AMSTRAD versions perform even worse than the other versions. This time, both versions pretty much drop the bar the exact moment you start your jump from the area you are able to jump. But if you do manage to get over the bar sometime, the event has been eased up a bit by having the lowest competition height the same as in practice mode. This decrease in difficulty has been applied to the AMIGA and ST versions as well. Probably the most complex event in Summer Games II, Fencing could almost do as a stand-alone game, and it is the most fun to play as a duel from any of the duel events in SG2. While I have no real knowledge on fencing terminology, some of you might, so I will just copy some phrases from the manual and Wikipedia to get this dealt with as cleanly as possible. The Fencing event is a "round-robin" tournament, which apparently means that every player must face every other player as their opponent in the tournament. Solo players need not worry about that, then. In a single-player mode, you will always control the fencer on the left. The goal is to score five hits before the timer runs out, or at least more than your opponent within the allotted time. Now, you've got two sets of movement: blocking (parry) movements, which are performed by moving your joystick around with no fire button pressed; and the attacking moves are performed with the fire button down. The parry movements are made virtually from a first-person perspective: moving the joystick up, down, left and right will move your foil exactly that way in front of you. If you manage to perform a block successfully, your opponent will be immobilized for a brief moment, wherein you can easily score a hit. The attack moves are, with the fire button held down: UP to thrust and recover to a defensive posture; DOWN to thrust and advance; LEFT and RIGHT to move left and right on the playing field. In most versions, you can only use the attack moves in single-time movements, so you need to push the fire button and a chosen direction every time you wish to perform some attack move. The AMIGA and ST versions allow you to keep the left or right movements performed in a loop for as long as you keep your fire button and the chosen direction pushed down. I don't know what's going on in the SPECTRUM and AMSTRAD versions (again), because any attempt at blocking has yet to be effective, and I haven't been able to get one hit acknowledged or both fencers hits nullifying each other on the SPECTRUM version. For the AMSTRAD version, I managed to get a couple of hits through by timing my thrusts with extreme precision, but more often than not, the computer opponent got through my attacks and/or defences and got his hit through with no effort whatsoever. In all the other versions, this event feels more like a game of strategy, quick thinking and some actual playability as it was meant to be. Although, it needs to be said, while the playability is otherwise okay for the APPLE version, it plays infuriatingly slow, and more likely than not, the game will be over by the timer reaching zero than either of the contestants winning the bout by score. It's a cycling race, to be more exact - another race against a human or a computer opponent. You just cycle your way through the straight line of great distance and try to reach the finish line before your opponent does. This is where the joystick is really needed, because in order to get anywhere, you need to move your controller in a clock-wise circle. Attempting to do so on four (or even worse, eight) cursor keys would result in some sort of an hemorrhage. For most versions, the trick is really just to keep your eyes on the pedals and move your joystick to the rhythm of your cyclist's feet, and of course, the SPECTRUM and AMSTRAD versions have the spinning directional arrow give you a false tempo. Some other versions have their own problems, too: for example, the APPLE version cannot be played with keyboard at all, as the game only responds to joystick controls in this event. This would otherwise be a good thing for all the versions, but in this case, the event plays so slowly that you wouldn't have any trouble getting a good time in it even with keyboard. 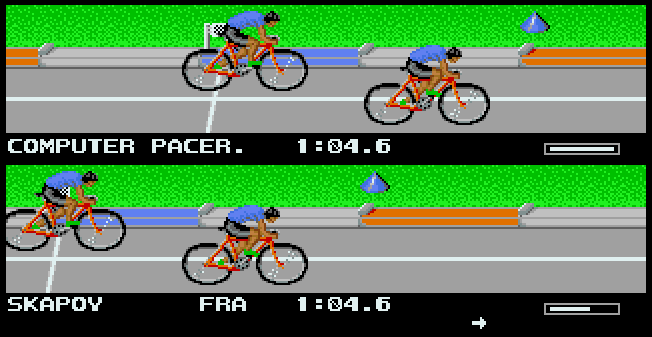 The AMIGA and ST versions have you follow the arrow instead of the cyclist's feet, which is not really a problem, but it just needs to be pointed out. The DOS version would probably be fine to play on a proper old PC with a 8088 processor and a CGA card, but in DOSbox, the game performs so unpredictably, at least when it comes to this event, that you'd probably be better off attempting to set up either a real old PC or a proper virtual machine with PCem. While the final event might look like the most challenging one on the list, I have to say, I always found Kayaking easier than it's made to look like, and most certainly more enjoyable than either High Jump or Equestrian. It's a race against time in a kayak going downstream, and your job is to get through a series of 15 gates in the correct manner. Make no mistake, the event does require some planning and speedy handling of your kayak, but once you get to know the track, it should be a fairly simple task to finish the course with no great problems. Handling the kayak is very simple: push the joystick once into any of the four directions, and your athlete will paddle once in the given direction. Holding the joystick in one direction will not help you. There are three types of gates that you will need to get through in their own specific ways: DOWNSTREAM NORMAL gates have a red marker on the left and blue on the right. Face forward as you go through these. DOWNSTREAM REVERSE gates have a yellow R-labeled marker on the left and a red numbered one on the right. Go backwards through these. An UPSTREAM gate has a red marker on the right and blue on the left. Go around and through this gate in the opposite direction, facing upstream. Penalties worth 20 seconds will be given to you when either missing gates, going through gates more than once, or going through gates in the wrong way. With some practice, at least the original C64 version of the event should be easily finishable in well under 2 minutes. The SPECTRUM and AMSTRAD versions have the course slightly altered, more particularly in the latter half of the map, so you need to do some readjusting of your plans for those two. Then again, the CPC kayak doesn't seem to respond to your control very much at all, so I'm not sure how much of that learning is useful. 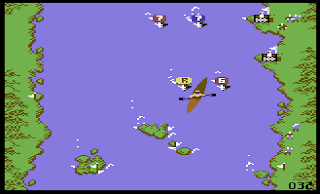 In the APPLE and DOS versions, the currents are heavier than in other versions, so it's more difficult to control your kayak through the course, but at least the APPLE conversion team has made the controlling a bit easier by allowing you to keep the directional controls down as long as you like for constant paddling. Still, due to the heavy currents, and the added difficulty given by lower framerate, it's more difficult than the other versions. The DOS version is simply diabolic here. 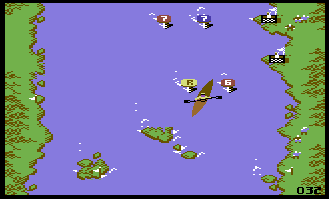 In the AMIGA and ST versions, the currents don't really seem to make much of a difference at all to your proceedings, but it takes a longer time for your kayak(er) to get up to speed. Moreover, trying to paddle backwards is really consuming, as it takes even more time to speed up - and to get back to paddling forwards again. That's not far off, really. The only things worth reminding here are, that the ATARI ST version runs slower than the AMIGA version, which makes it the less recommendable one of the two otherwise similar versions; and that the APPLE version I used for the making of this comparison couldn't start the Triple Jump event, so I had to give it the lowest score. If I ever get my hands on a working copy of the game, the score might change in the future. What we have learned from here, is first and foremost, that none of the versions are completely similar to each other, thus rendering each event's results incomparable with other versions. Secondly, the original is easily the best of the lot to play, which shouldn't really surprise anyone after how the first two games in the series turned out. 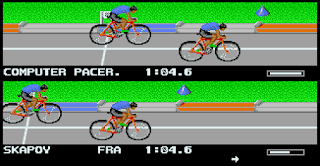 Third, there are some interesting and significant differences between some versions, mostly the SPECTRUM and AMSTRAD duet, compared to every other version, which not only offer new challenges to players already too familiar with the original, but for me at least, they offered a new sort of a re-enlightenment on how well the original Summer Games II is actually made. So, first half down, the other half to go. For those of you still interested in the rest of the comparison, it should be ready by the end of the month - keep your eyes open!